In 2009, the late former Zimbabwean Vice President John Landa Nkomo became famously known for his peace exhortation, "Peace begins with me; peace begins with all of us". He saw no reasons for Zimbabweans to attack each other if they differed on a point or issue. Fast track to 2018, President Emmerson Mnangagwa has been calling for peace throughout the election season as the country headed for the just-ended elections. To demonstrate his commitment for the peace that he was preaching, President Mnangagwa went on to open the political space in the country resulting in the increase in the number of political parties from 42 to 133. As if that was not enough he promoted free campaigning in all corners of the country and the MDC Alliance for the first time tested what it felt like to campaign freely in rural areas. The Alliance would be the best witness of the opened up democratic space. Even the various observer missions who were accredited to observe the plebiscite hailed the peaceful and calm environment. As the true Statesman that he is, President Mnangagwa called for calmness. He had this to say to promote peace as the Zimbabwe Electoral Commission (ZEC) continues to announce the election results, "Millions have voted in mutual respect and peace, Zimbabweans should wait patiently for the electoral commission to announce the results". As the parties were winding up their campaigns in line with the dictates of the Electoral Acts last Saturday, the MDC Alliance members openly declared that they were going to take to the streets if the election outcome was not in their favour. They made it loud and clear that they would start a "war" of their own. They foolishly concluded that kusiri kufa ndekupi". 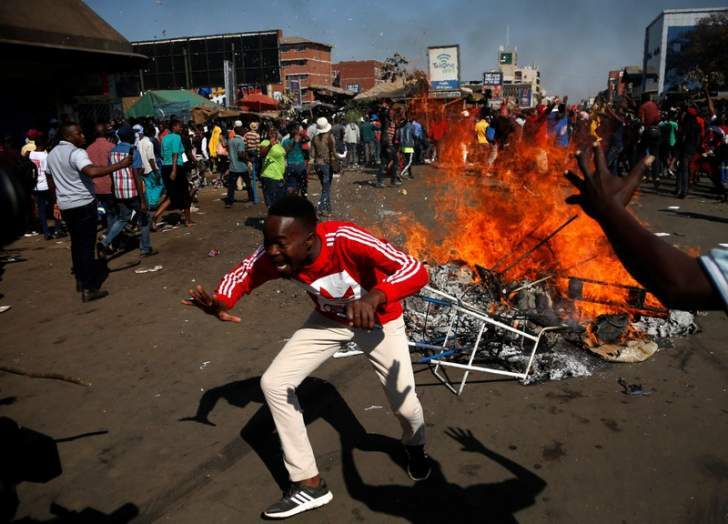 As the election results are trickling in and they are realising their electoral defeat, the MDC Alliance youths are calling out to the "masters of violence", Job "Wiwa" Sikhala and Youth Assembly Chairperson, Happymore "Bvondo" Chidziva to prime their violence machinery for action. Chamisa himself declared that he was not going to accept anything short of 65 percent of the Presidential vote. Wamba dia Wamba as Chamisa is affectionately called by his followers is on record promising post election violence. He was quoted saying "Hakudyiwi rinopisa muno . . . mukaita zvokutamba ndinodira jecha muupfu. Hamuridyi sadza iroro." It takes two to tango and Chamisa must be man enough to accept defeat, which is the essence of an election and democracy that he is always harping on about. The Alliance's threats of violence remind many peace-loving Zimbabweans of the terror group, Vanguard under the leadership of Shakespear Mukoyi which terrorised the hapless Dr Thokozani Khupe at the funeral of the late MDC-T leader, Morgan Tsvangirai. MDC-T candidate for Harare Central Constituency, Linda Masarira‏ posted on her twitter handle @lilomatic conceding defeat saying "Good morning. It has been a hectic journey to 2018 elections. I concede defeat with dignity in Harare Central Constituency. Like I said earlier its either I win or I learn. I have learnt a lot about political dynamics in Zimbabwe which I have fully documented". This is the type of political attitude that the country needs to take the nation forward. It contrasts sharply with the MDC Alliance's "It's either my way or the highway" kind of tin pot "democracy." Zimbabweans are a peace-loving people. They should not listen to these merchants of regime change who are bent on causing anarchy and despondency in our peaceful country. Keep calm, elections come and go, we must not lose our dignity like what Wamba dia Wamba who even want to go to an extent of announcing election results contrary to Constitutional provisions. The Electoral Act Section 66A states that "(1) No person other than an electoral officer, acting in accordance with this Act, may officially declare and announce the results of an election and (2) No office-bearer or member of a political party shall purport to declare and announce the results of any election before it has been declared officially by an electoral officer". This is all being done in an effort to provoke the authorities so that he could find a basis to cause riots. Wamba dia Wamba in his lack of wisdom on 1 August tweeted "Zec seeks to release results to buy time & reverse the people's presidential election victory. The strategy is meant to prepare Zim mentally to accept fake presidential results. We've more votes than ED. We won the popular vote & will defend it!". The dubious advocate is clearly breaking the law. However, in all this, the country's security apparatus is not resting on its laurels. Minister of Home Affairs and Cultural Heritage, Dr Obert Mpofu, had to convene a press conference on 31July to remind people not to go beyond the dictates of the law and commit electoral crimes such as announcing election results.